5 Most Expensive Scandinavian Design Furniture | What is it worth? Yes, we are talking about Scandinavian Design. The mid-centurian movement, which took the world by storm in 1940s, is once again seizing the stage, achieving worldwide popularity, especially in the last 5 years. Top international auction houses, such as Phillips and Sotheby’s, hold annual sales dedicated solely to Nordic Design and achieve millions of euros in sales. What better way to measure a style’s popularity then to look at auction results? 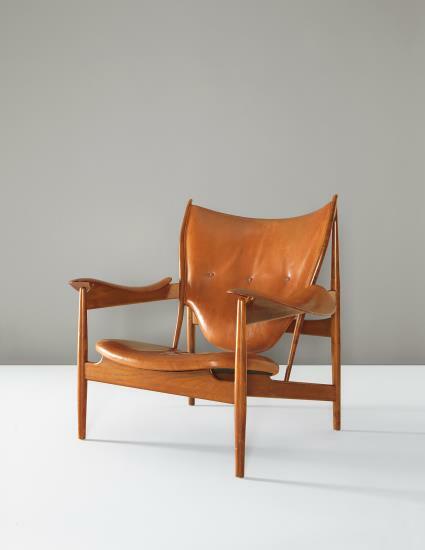 Here is a list of the 5 most expensive Scandinavian Design furniture from the top international auction houses. Hans J. Wegner‘s Cowhorn Chair is the proof that a small chair sometimes packs as much luxury and artistic genius as a lounge chair. 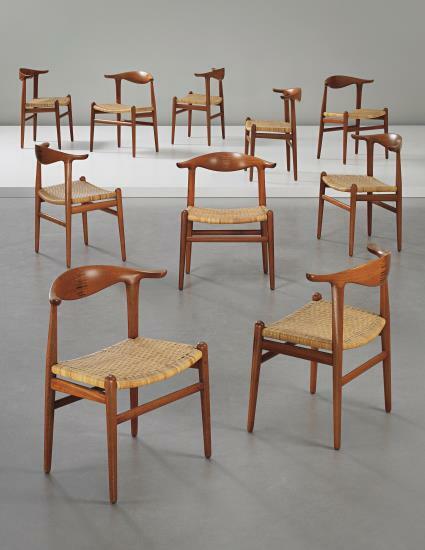 One of the smallest chairs designed by Wegner, this set of ten Cowhorn Chairs, designed and produced in 1952 have achieved £ 206,500 -way over the £ 70,000 – 90,000 estimate- at Phillips’s Nordic Design sale in September 2014. The chairs are made of teak and cane, shaped into perfection by master cabinetmaker Johannes Hansen. This set is possibly one of the first examples of the Cowhorn Chairs and it was exhibited at the famous “Copenhagen Cabinetmakers’ Guild” Exhibition (26 September–12 October 1952), which almost always drives up the hammer price. This exceptional “Spiral” Wall Light was designed by light genius Poul Henningsen for the Scala cinema and concert hall inside the Århus Theater in Denmark. The work consists of two adjoined spirals made from aluminum, painted aluminum and brass. Adjusting metal surface texture to achieve perfect no-glare light diffusion was Henningsen’s expertise. Throughout his career, he carried out numerous experiments to attain this perfect diffusion and a soft, organic shade of light. This lot is one of 26 original double-spiral wall lights designed by Poul Henningsen in 1955 for the Scala cinema and concert hall, one of five performance spaces within the Århus Theatre. Scala went through an extensive renovation in 1981, which reduced its size, therefore 12 lights were de-accessioned. The other 14 remain in their original place. It is very rare to come across one of these in an auction. When we look back further to auction history, we see that over the years, the hammer price for the Scala wall lights have increased drastically. 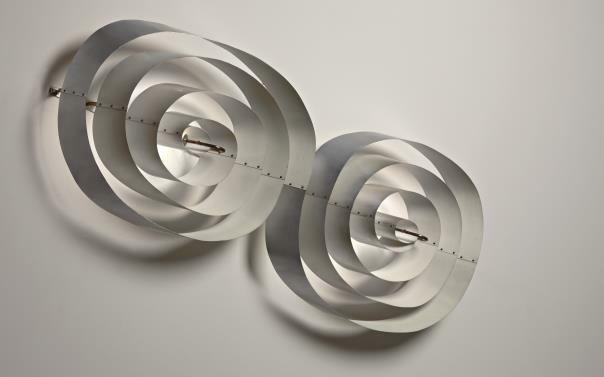 In 2006, the same light (10 cm smaller in width) sold for only $69,600, again at Phillips. It is not much, compared to the £253,250 sum this lot achieved only 5 years later, in November 2011. The heated bidding process for this lot reveals the rise in demand for Scandinavian Design in the last decade. 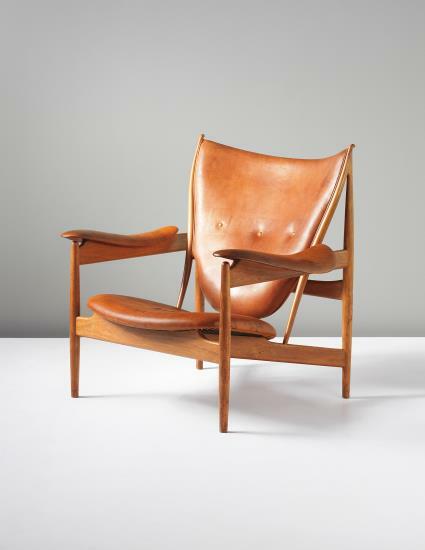 The Chieftain Chair is one of the famous masterpieces by Finn Juhl, designed at the peak of his career. Carrying Juhl’s signature curvy and sleek lines, this design was produced in c. 1950 by famous cabinetmaker Niels Vodder, who often collaborated with Juhl. Juhl, who originally wanted to be a painter and was influenced by the contemporary art movements of his time -such as avant-garde, Surrealism and Abstract Expressionism-, used furniture design as an extension of art. Just like a painter would, he used symbolism in this design to abstract a “Chieftain”, a tribe leader, hence the name of this chair. This abstraction could be categorized as reverse-allegorizing, where a person is depicted as an object. The pointy sides of the chair’s back resemble a bow and the armrests resemble saddles, epitomizing a chieftain riding his horse, carrying a bow on his back. This design was exhibited at the Copenhagen Cabinetmakers’ Guild Exhibition (30 September–16 October 1949), which makes an object high on demand and drives up auction prices. It was sold for £290,500 in September 2014, above its estimate of £150,000 – 250,000, making it the third most expensive Scandinavian Design furniture. Although almost identical to the previous lot, this example of the Chieftain Chair sold for £422,500 in 2013, breaking the world record for most expensive Scandinavian Design furniture at that time. The price estimate was only £50,000 – 75,000, so we can assume this was certainly an unexpected price. It is possible that this example was more valuable because it was an earlier production than the other, or this one’s leather survived better. However, it is more likely that it was a fortunate coincidence, one of those moments that the planets aligned and the bidders got into a 20-minute-long bidding war, gaining recognition for this fantastic design and getting its name written in the design hall of fame. Considering the same chair, in natural leather color, sold for $31,250 in June 2010, this sale is a big step also for Danish design. The time has come to reveal the world record for Scandinavian Design Furniture. 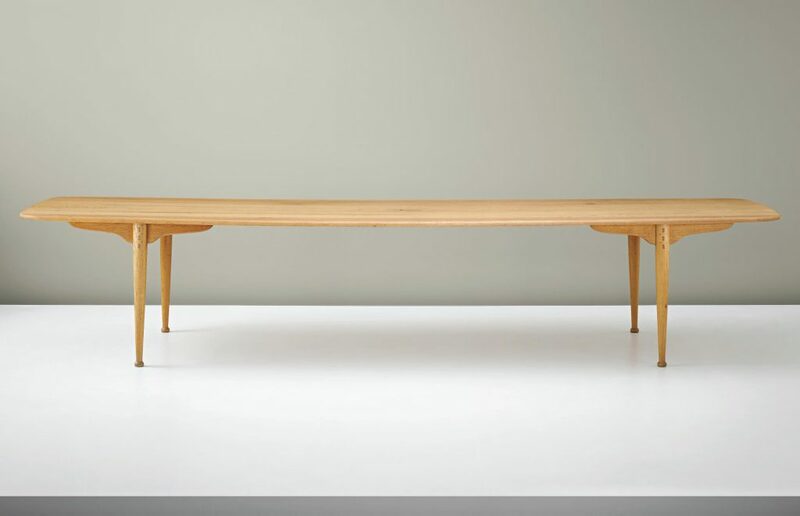 This one-off table designed and produced by famous Danish designer and cabinetmaker Peder Moos sold for £602,500, about 4 times its estimate, following a rare bidding war in the auction room. The table was designed and produced for the Villa Aubertin in Rosnæs, Denmark. Finn Juhl was the architect of the house and although he designed all of the interior furnishing himself, he asked Peder Moos to make the dining table. Unpolished and pure, this modest design stands on two elegant legs, joint with wooden nails, creating a wholesome and warm look, typical of Danish Design. Peder Moos, Unique dining table, designed for the Villa Aubertin, Rosnæs, Nakskov Fjord, 1952. Oak, maple. 72.7 x 379.8 x 98.6 cm. Executed by cabinetmaker Peder Moos, Denmark. Estimate £150,000 – 250,000 Sold for £602,500 in October 2015 at Phillips. Photo courtesy of Phillips Auctioneers. “Among his contemporaries, Finn Juhl felt a certain kinship only with Peder Moos, the joiner who made all his furniture himself and was consequently able to find precisely the pieces of wood that had such a dense and homogeneous fibre structure that he could permit himself to work with dimensions that were even more slender than any Finn Juhl dared dream of” (Arne Karlsen, Danish Furniture Design: in the 20th Century, Volume 2, Copenhagen, 2007, p. 111). This quote explains why Juhl might have chosen Moos to design this table, which stands as the epitome of the friendship and colleague spirit between Moos and Juhl. One of Kaare Klint‘s students at the Department of Furniture at the Royal Danish Academy of Fine Arts, Peder Moos was an unconventional artist, the enfant terrible of Danish Modern. His eccentricity could include anything from unfinished furniture to amusing titles for his exhibits. Moos avoided the use of nails and he despised the use of polish, as seen in this table. “that it is possible to bring the art of furniture making to such a degree of perfection” and added, “a man for whom the work itself is sacred and who considers the economic result to be an irrelevant banality”. (Grete Jalk, ed., Dansk Møbelkunst gennem 40 aar, Volume 3: 1947-1956, Copenhagen, 1987, p. 24). Peder Moos combines in himself the two main parts of what made Danish design so famous: genius designer and master craftsman. Adding the uniqueness and artistic brilliance of this table, it is not surprising that it reigns over other Scandinavian Design furniture as the most expensive one ever sold at an auction. Photos courtesy of Phillips Auctioneers.